Welcome to a brand new month of the Rainbow Scrap Challenge. 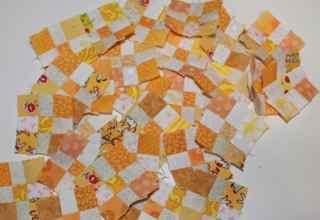 I've already dug out a few yummy yellow scraps and worked them in as leaders and enders. Though I do enjoy yellow, it is always one of those colors that I feel is best in small doses. Spread out over the surface of a quilt, it adds a nice bit of sparkle and shine. What are your feelings on yellow? Use mister linky below to share your thoughts, your plans, your scraps! For the new people joining in recently, there are no rules and no quilt police. Just grab some yellow scraps and try to make something out of them. It can be part of an ongoing project, a few blocks between other quilts, even a small standalone or old UFO. Whatever you can find that has some yellow in it. Jump in and use some scraps! Yellow is a yummy colour. Looking forward to getting my scraps together. Yummy yellow. I am seriously behind in this challenge. My rainbow has a lead pot at the end of it. I'll keep trying to catch up. It snuck in when I wasn't looking. After avoiding it all my life, I love yellow now. I've linked up. Your yellow 9-patches look great! I love yellow in quilts and look forward to seeing everyone's projects with it. Yellow is my favorite color and I love sewing with it (a little or a LOT!). I love yellow. Even my sewing room is painted yellow. Should be a fun month to see everyone's blocks. My sister loves yellow, so something from this month will have to end up in her possession! Me, sparingly, like you said! I love yellow! But for some reason, only seem to be able to pair it with purple. Yellow is the perfect colour for June...can't wait to get sewing!